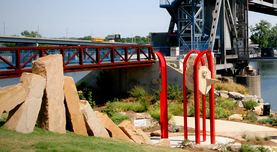 Create a Public Art Program in your city; we will assist with creating the policies, funding strategies, and contract agreements necessary to place a public art statement(s). We can help create a cohesive collection that tells your story. Tie into existing works or add a whole new vision. One on one services enable you to set a budget for a one-time purchase or a series over time so that your collection comes together with ease. Through our proven design-team approach, we strive to develop and nurture long-term relationships with our clients. With years of industry experience, our skilled project managers are attentive to your specific needs to successfully manage your art project on schedule, within budget and with the highest integrity possible.